The Eremitageløbet is Denmark's oldest road running event. This year's race is scheduled for the 4th October and many runners have already started their training for the event. For those training for the race and for anyone else who has an interest in the event Søren Johannessen has created this Google Earth plug-in tour of the race route. The tour gives the viewer a fly though of the route and is accompanied by a soundtrack of Lars Krimi's 'Distorted Dreams'. 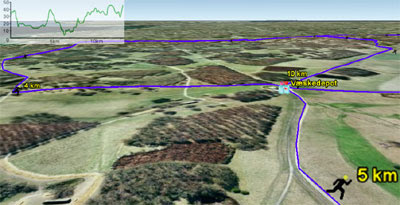 Thekmz.co.uk has created a kml of all the 2009 Formula 1 Grand Prix tracks. The kml file contains tours of the tracks so that now you can pretend you are Lewis Hamilton flying around Monaco at 180 mph.